Members of the Silver Lake Fire Department volunteered as bell ringers for the Salvation Army’s “red kettle” campaign at Coborn’s in Glencoe last week. Shown above are Ron Posusta and Michael Boyer. 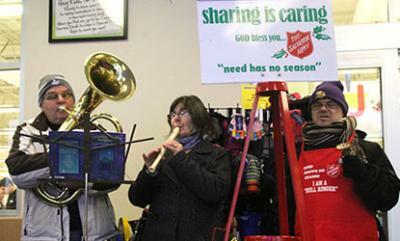 Collections donated to the red kettle support local Salvation Army programs, including emergency assistance and youth programs. More volunteers are needed; contact Rita Weber at 320-864-6657 or 320-296-0130 for more information or to volunteer.